For those living dairy and gluten free, you know all too well how it can be when you head off to a BBQ or picnic. Will there be something I can eat? Well, here's a great recipe that you can not only eat but others will be all over it as well. And, it gets better the next day...so you can make it before party day and just relax and enjoy. 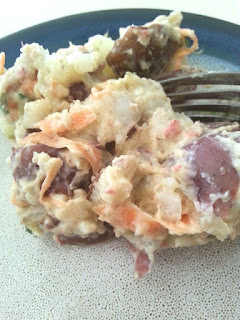 Sweet and tangy, this recipe plays off the classic flavors of an Amish potato salad but omits the dairy, gluten, and egg ingredients. If you haven't had this style of potato salad it's a great way to change up the flavor and bring in a nice zing to your side dish options. It does have a savory aspect to it, like traditional potato salad, but the sweet kick is a hit with everyone at the BBQ. 1/3 cup apple cider vinegar, (with the mother for the health benefit if you have it). 1 tbsp salt. You can opt for less or more depending on you taste. 1 cup of full fat canned coconut milk chilled. 1. In a large pot boil potatoes until fork tender. While potatoes boil make sure to do the next few steps. 2. In a large bowl, combine apple cider vinegar, and honey. Mix until honey is dissolved into the vinegar. Then add in the mustard and the ground flax. Again, mix together well. 3. Now add in the remaining ingredients but hold off on the coconut milk, carrots, onions, and bacon bits, mix together well and at this point your ground flax should start to thicken the mixture. 4. Add in the rest, except for the potatoes. 5. When potatoes are done, remove from boiling water and allow to rest in cold water to stop the cooking. I also put a ice on top to really help bring the temps down better and faster. Roughly cut up the potatoes and immediately add into the dressing mixture. It's ok if they are still a little warm; it helps bring the flavors together better. Fold potatoes into the dressing. When well combined allow to cool in the refrigerator until ready to serve. When it comes time to serve, you can always top it off with some more chopped chives, or parsley, and for the meat lovers, more bacon of course. As for the skins on the taters...this is a total taste preference. I like the skins on still, but you can peel them before cooking if you aren't a fan. It doesn't really change the flavor, more the mouth feel of it all. Oh no...this little guy wasn't the least bit excited to dive right into his Teenage Mutant Ninja Turtle cupcakes, not at all. 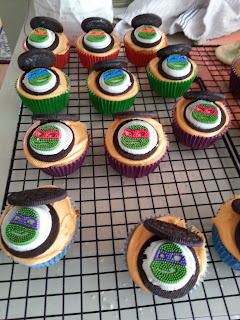 Admittedly, this was his second year of a TMNT themed bday party. The difference? He started school this year so we made a bigger to do of it than the family and friends style one from last year. 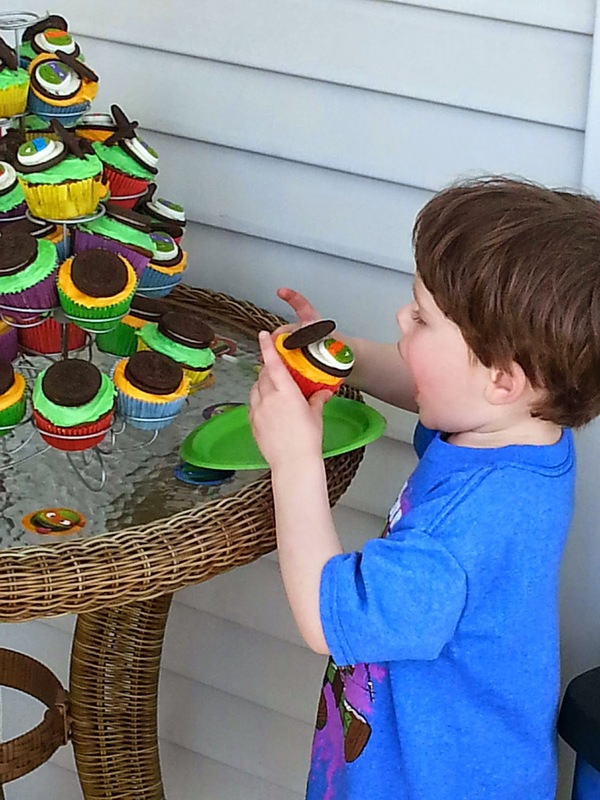 Now don't get me wrong, I love baking cakes, but for little ones and birthday parties, cupcakes are my go to. Much easier to serve, and easier for little hands to pick up and eat. The next thing you are going to want are Oreo cookies, or similarly styled store brand cookies. These are going to be your sewer lid covers for those turtles to peep through. I twisted the tops off carefully and stored them tightly in a Ziploc bag while I waited for the cupcakes to bake and cool. This just makes the assembly part much easier when the time comes. You're also going to want frosting for your cupcakes, and I just did a mix of green and orange for ours since we had both chocolate and vanilla cupcakes. Along with that, make sure you get a tube of plain white frosting. 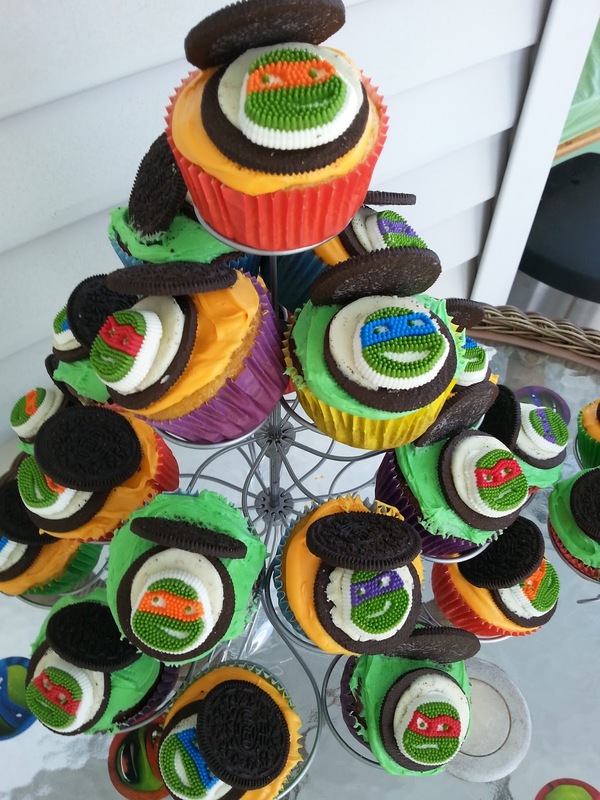 This makes it possible to attach those fun sugar turtle faces to the cream side of the cookies. To get those just click here to order them off of Amazon. After you peel off the sugar face from the packaging, just put a dab of white frosting on the back and then push it onto the cream side of the cookie to secure it. Again, do all this while you wait for the cupcakes to bake and cool to make the final process that much easier. To put them all together, frost your cupcakes and then put the cookie side with the faces onto the cupcake. Then, angle the plain cookie side just a bit and stick it into the frosting to look like the lifted sewer lid. Hint:Make sure your cupcakes have a good thick layer of frosting to hold everything in place. When you have everything put together, place in your fridge to cool the frosting and secure everything in place. For a little variety you can also just put plain Oreos on the top of some of your cupcakes. Just remember to take the cupcakes out about an hour before serving so the frosting won't be rock hard but will still keep the lids lifted.